On Tuesday night, the Cats opened their 2015 SEC season against Ole Miss at Rupp Arena. Even though UK entered the game a prohibitive favorite to tuck their 14 th win away by 20 or more points, Coach Kennedy's Rebels had their own ideas about how the game should play out, and who should leave Rupp arena with that precious Win. 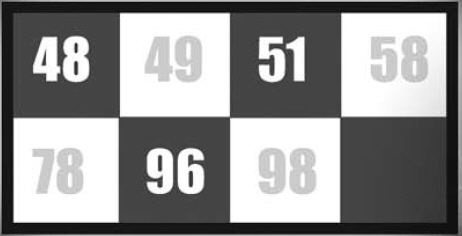 They went toe to toe with the mighty Wildcats for 40 minutes, and when the final buzzer sounded, neither team had secured the Win, so they had to play an extra 5 minutes to resolve the question. The Cats did win at the end by 3 points, 89-86, but the Rebels had a final shot with a chance to tie the score that missed the mark by a few inches and caromed off the back of the rim into Kentucky hands. The Cats advanced to 14-0, 1-0, and the Rebels returned to Mississippi 9-5, 0-1 just as the experts had predicted. 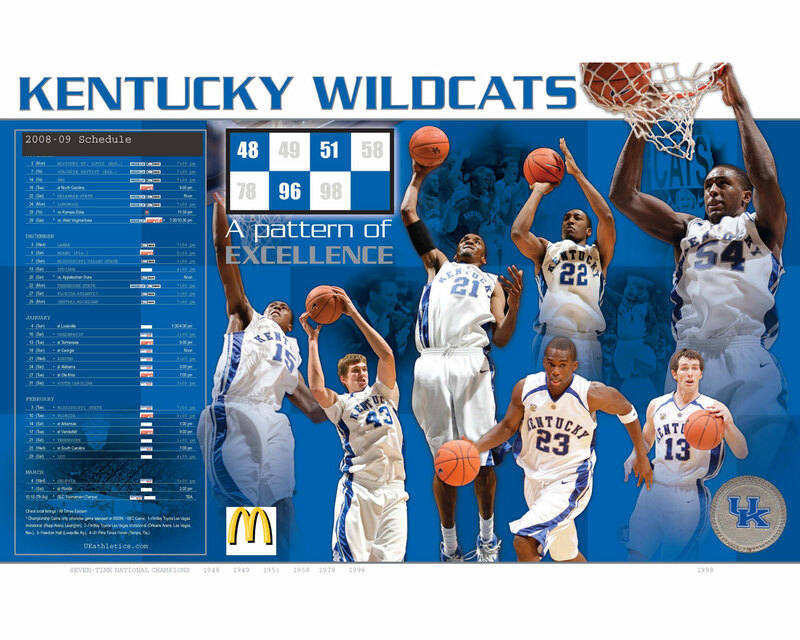 However, the game sent waves of confidence through the Mississippi camp and shock waves throughout the Big Blue Nation. In my view, neither reaction is completely justified solely by the outcome of this single basketball game. The SEC season is a long and winding road that will take these Cats through College Station Texas, Tuscaloosa, Alabama, Columbia, South Carolina, Columbia, Missouri, Gainesville, Florida, Baton Rouge, Louisiana, Knoxville, Tennessee, Starkville, Mississippi, and Athens, Georgia spaced among nine SEC games at Rupp. While the Cats got a scare at Rupp Tuesday, the real tests of a SEC season occur on the road because Champions must be able to hold serve at home and win enough on the road. The Cats and Aggies do not have a common opponent leading into this game. The Aggies finished their non-conference schedule with a 9-3 record, and the Aggies dropped their SEC opener at Alabama by 21 points, 44-65. The Aggies' best wins have been by 1 over #74 Arizona State and by 13 over #93 New Mexico on a neutral court. Texas A&M's most perplexing loss was by 13 to #104 Kansas State. Texas A&M's non-conference schedule has a strength of 0.4882 ranks #210, and the Aggies schedule strength after their SEC opener stands at 0.5246 (#196). TEXAS A&M has played its first 13 games at an average tempo of about 66 possessions per game, scoring 68.1 ppg (1.047 ppp) and allowing an average 61.4 ppg (0.929 ppp). TEXAS A&M has turned the ball over on 18.3% of its possessions while forcing turnovers on 21.7% of opponent possessions. On the Boards, TEXAS A&M has secured an offensive rebounding rate of 32.2%, and a defensive rebounding rate of 72.4%. In contrast, the Cats have averaged about 66 to 67 possessions per game, producing 76.3 ppg (1.14 ppp) and allowing 50.6 ppg (0.76 ppp). The Cats have committed turnovers on 17.5% of its possessions and forced turnovers on 24.8% of opponent possessions. On the Boards, the Cats' rebounding rates have been 45.7% and 65.9% on the offensive and defensive ends. The Cats' non-conference schedule has a strength of 0.5763(#98) and the Cats' schedule strength after their SEC opener stands at 0.5817 (#69). Based on this distribution, the analysis tips in favor of KENTUCKY by 12 points, 70-58 in a game played at a pace of 66 possessions for the Cats and 66 possessions for TEXAS A&M. Pomeroy figures the Game in Kentucky's favor by 12 points, 68-56 at a pace of 63 possessions. The March towards March in Search of Perfection will continue Saturday afternoon in College Station against Texas A&M. The starting players for the TEXAS A&M game are Willie Cauley-Stein,, Karl-Anthony Towns, Trey Lyles, Aaron Harrison, and Andrew Harrison. Platoon 2 consists of Dakari Johnson, Marcus Lee, Devin Booker, and Tyler Ulis. Derek Willis, Dominique Hawkins and E. J. Floreal to provide deep reserve help should the game require or permit Coach Calipari to go to his 10 th , 11 th or 12 th players. The Cats control the opening tip, but miss their first 7 shots, including 4 attempts for outside the arc which allows an aggressive bunch of Aggies run out to a 7-0 lead at the under 16 media timeout, and after the timeout, the Aggies will have a free throw to complete a 3 point play, and a potential 8-0 start. After the timeout, the Aggies miss the free throw, but that does not stop the Aggie express, as they manage to extend their lead to 10 points, 16-6, prompting a UK timeout with 13:10 remaining. After the timeout, the Cats get 5 straight to trim the lead to 5, 16-11 at the under 12 media timeout. TAMU will have the ball after the break. In the third segment,the Aggies continue to shoot the ball at a 50% clip, and the Cats do not, and trail by 7, 24-17, at the under 8 media timeout with 7:03 remaining in the first half. The Cats have made only 6 of 19 attempts while the Aggies have made 11 of their 21 attemps. The fourth segment is more of the same, and the lead ballooned to 11 points, 28-17 before the Cats finally managed an interior basket from their half court offense to trim the lead to 9 points, 28-19, at the under 4 media timeout. TAMU has also controlled the Board at both ends. The Cats management trim the lead to 3 points, the closest they have been since TAMU hit a 3 pointer to move on top 5-0. The halftime score is 25-28. The first half was played at a pace of 31 possessions (62 game pace). The Cats scored its 25 points on 31 possessions (0.81ppp) and TEXAS A&M scored 28 points on 31 possessions (0.90 ppp). The Cats shot poorly in the first half making 9-30 (30.0%) overall and 6-13 (46.2%) from outside the arc. TEXAS A&M shot extremely well for the half, making 11-23 (47.8%) inside the arc, and the Aggies were 2-5(40.0%) shooting the ball from outside the arc. 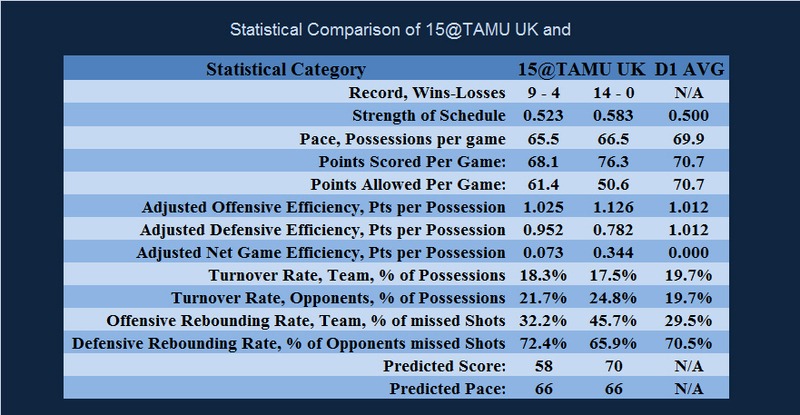 From the line, UK made 1-4 (25.0%) while TEXAS A&M made 0-3 (0.0%). Kentucky won the battle of the boards in the first half, out rebounding TEXAS A&M 22-18 overall. Kentucky also managed to grab 8 offensive rebounds to only 4 for the Aggies. Kentucky holds a 6-5 advantage in second chance points at the end of the first half. The Cats managed to get 36.4% of its misses, while TEXAS A&M grabbed 22.2% of its misses. The Cats committed 7 turnovers (22.6%) and forced 6 TEXAS A&M turnovers (19.4%). The Cats open the second half with a move to the paint and Willie Cauley-Stein scores on the Cats' third shot of the possession to pull to within 1 point. The closest they have been since TAMU made the first basket of the game. After a TAMU miss, Willie Cauley-Stein made a pair of free throws to ease the Cats into their first lead of the game, but TAMU regained the lead on a pair of free throws of their own. The Cats trail by 1, 32-31 at the under 16 media timeout. TAMU will have the ball after the timeout. After the timeout, the Cats' defense gets a stop, and Dakari Johnson is fouled after getting an offensive rebound under the basket. He made 1 of 2 to bring the Cats even at 32-32. TAMU is unable to inbound the ball and takes a timeout to preserve the possession. After another defensive stop, Andrew Harrison put the Cats on top by 2 with a drive. A 3 pointer by Devin Booker, and a pair of free throws by Devin Booker gave the Cats their biggest lead at 6, 39-33, but a shot in the lane went down, with a chance for a 3 point play just before the under 12 media timeout, trimming the lead to 4, and TAMU will have a free throw after the break for a chance to trim the UK lead back to 3. Since TAMU led 28-17 at the under 4 timeout of the first half, the Cats have outscored the Aggies 22-7. The Aggies manage to pull even at 39-39, but the Cats go on an 8-2 run to move back on top by 6, 47-41, prompting a TAMU timeout with 8:52 remaining in the game. After the timeout, the teams trade turnovers and missed shots as the score remains the same at the under 8 media timeout with 7:22 remaining, and TAMU in possession. The Aggies trim the lead, that rose to a maximum of 9 points, to only 4 points, forcing Coach Calipari to take a timeout with just under 5 minutes remaining and the Cats in possession, protecting a 48-44 lead. Booker misses from 3 point range, and the lead shrinks to 2. Aaron Harrison misses on a drive, and TAMU is fouled with two free throws to tie the score, as Willie Cauley-Stein fouls out of the game with 4:29 remaining. He missed them both. Aaron Harrison drains a 3 pointer from the corner, but TAMU races to the other end for a basket to cut the lead back to 3 points. The Cats fail to score on their next trip, and TAMU takes another timeout, leading to the under 4 media timeout. TAMU has the ball down 3, 51-48 with 3:33 remaining in the game. Booker fouls Caruso and Caruso makes 1 of the two shots. Andrew Harrison is fouled as he made a move toward the basket, and Andrew Harrison makes them both. TAMU scores on an off balance fall away attempt that banks into the basket. Aaron Harrison misses from the right wing, and TAMU takes a timeout down 2, 53-51, with 1:26 remaining. The Cats allowed TAMU to get 3 shots at the basket before Dakari Johnson was able to get the rebound, Cats up by 2, with the shot clock off. However, Aaron Harrison went to the rim instead of using the clock, and after he missed, TAMU gets the benefit of the block/charge call, makes both to tie with 18 seconds remaining. The Cats unable to get a final shot take a timeout with 1.3 seconds left. After the Cats' timeout, TAMU takes a look at the UK player alignment and takes a timeout of their own. Aaron Harrison missed from long range, and for the second straight SEC game, we have overtime. The Cats get the first possession but can't score until after a TAMU miss, Devin Booker makes a layup and is fouled. He missed the free throw. 1 for 2 at the line for TAMU, couples by 2 scoreless trips, allows TAMU to regain the lead 56-55. The Cats turn it over with 1:35 remaining, down one. After all the dramatics, these teams still cannot decide who should leave with the W, and they will play a second overtime tied 57-57. Cats again get the first possession, but fail to score. The Cats win it at the free throw line by 6, 70-64 in double overtime. UK scored its 70 points in 77 possessions (0.91 ppp) for the game, and TEXAS A&M scored its 64 points on a total of 77 possessions (0.83 ppp). Kentucky won the battle of the boards, with a rebounding edge 53-52, but the Aggies won the battle for the offensive rebounds 18-16. The Cats won the second chance points 15-14. TEXAS A&M had an offensive efficiency of 0.649 ppp on its 77 first chance possessions and 0.778 ppp for its 14 second chance possessions. UK had 0.714 ppp on its 77 first chance possessions and 0.938 ppp on its 16-second chance possessions. With respect to the offensive rebounding, UK grabbed a weak 32.0% of its misses as offensive rebounds while TEXAS A&M was able to convert 32.7% of its misses into bonus possessions with offensive rebounds. UK hit well from the free throw line in this game, making 25-35 [71.4%]. TEXAS A&M made 16-30 [53.3%] for the game. Field goal shooting for UK was 18-64 overall [28.1%] and 9-28 from long range [32.1%]. For TEXAS A&M, their field goal shooting from inside the arc was a fair 21-54 [38.9%] and from long range, TEXAS A&M hit 2-15 [13.3%]. The Cats committed 12 turnovers, one for every 6.4 possessions. The Cats forced 12 TEXAS A&M turnovers, one for every 6.4 possessions. Next Game On Schedule: Tuesday night, January 13, 2015 against Missouri n the third SEC game of the 2015 season at Rupp Arena. To Is The 2014-15 Season Really More Unpredictable?